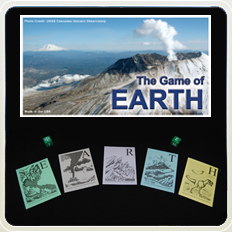 Our Earth Science games provide hours of challenging, friendly competition. The questions are presented at four levels of difficulty permitting players of different ages and abilities to enjoy competitive rivalry. Questions are a mixture of conceptually-based and factual recall. To win, a player must be first to correctly answer one question from each of five categories – Stars, Planets, Astronomy, Constellations and Exploration – to complete the word “SPACE.” Four levels of difficulty permit family members, friends or classmates to play and compete with each other. The first player to correctly answer one question from each of five categories - Environment, Atmosphere, Resources, Tectonics and History to complete the word EARTH wins! Four levels of difficulty permit family members, friends or classmates to play and compete with each other. 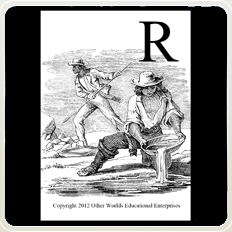 Purchase The Game of EARTH + the 'R' Rocks & Minerals Card Deck as described below and save $1.95. These questions may be substituted for the “Resources” category of The Game of EARTH, or may be used independently with special rules provided. Activity includes 47 game cards, each with 4 questions / answers of increasing difficulty. Purchase the CD to produce as many sets as you wish or purchase a complete set 'Ready for Play'. 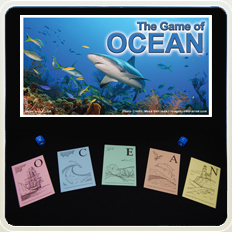 To win, a player must be first to correctly answer one question from each of five categories – Oceanography, Circulation, Environment, Animals and Navigation – to complete the word “OCEAN.” Four levels of difficulty permit family members, friends or classmates to play and compete with each other. 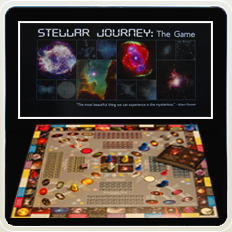 Each player moves his/her game pieces around the gameboard gathering mass and time to form three protostars of different mass. Once born, all three stars continue gathering the time required to evolve through each stage to eventually end their lives as a white dwarf, a neutron star, or a black hole. The first player to successfully evolve all three stars to their final stages wins. For 2 to 4 players. grades 6 and up. 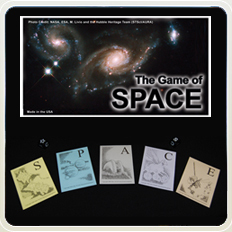 "The Game of SPACE has worked well as a review/study tool for my 8th grade Earth and Space classes." Thank you so much! Our Science Olympiad team has benefited so much from the road scholar units and stellar journey game. Our team placed 5th in road scholar at regional yesterday and 3rd and 4th in reach for the stars. I'm certain i will be back to purchase additional items!